So my son's kindergarten graduation is coming up next week. So I was thinking back to my Kindergarten Graduation. I remember getting these little octopuses made of yarn that some mom made for us. So I wanted to make something for my son's class other than just a goody bag. So I decided to make the school mascot an Owl. So I went to Jo Ann's and found the perfect fabric. And of course it's designed by a scrapbook paper designer too. It was made for Joann's itself . It is by Heidi Grace. It is too cute. It has encouraging words and has little wood stumps all over it. Perfect for making the owls. 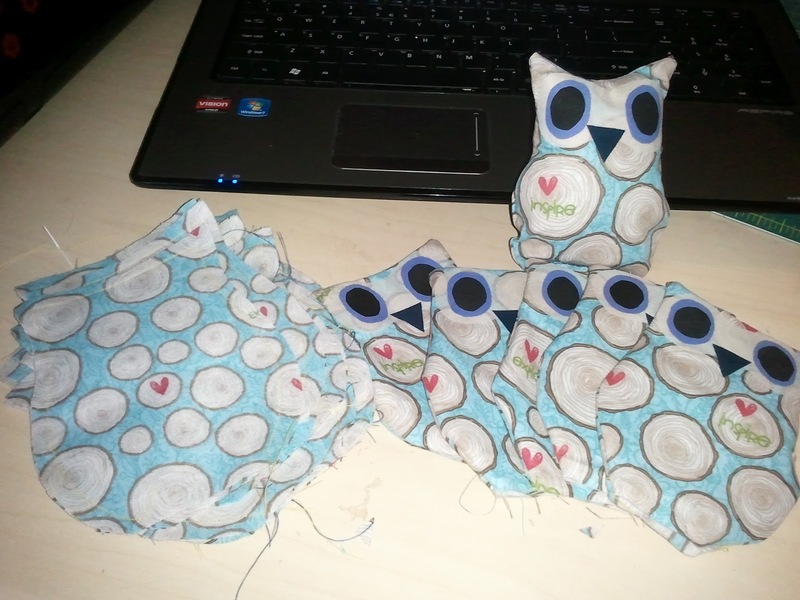 I used the Otis the Owl Template from the SewSimple website and made some of my own tweaks. Here are some pics below. It was simple to put together. I used fusible webbing to put on the eyes, beak and face. Oh and stuffing is this large bag from Joann's it was only about $6.00. 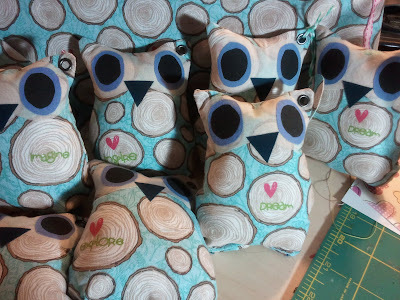 I can make about 100 of these owls with it. I also made little hang tags for the owls using scraps of material. Some adhesive backed canvas by Ranger and Martha Stewart's Stamp your Own kit. (the link is to a similar kit Mine is from Michael's). And some twine from The Twinery in Caribbean. I punched holes in the tags and the owls ears with my Crop-A-Dile and added a grommet to both. I stamped the canvas first then stuck the whole sheet of canvas to the material and just hand cut around the stamped image. 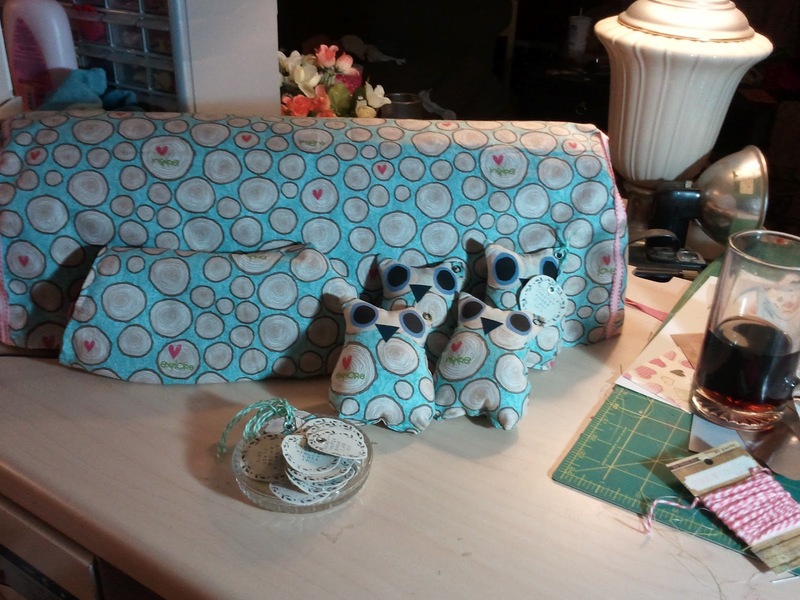 I still had about 1 yard left over after making 24 owls and tags. so I decided to make me a Dust Cover for my Cricut. Had a few hiccups but it came together in the end. And still had enough material left over to make a cover for my Gypsy. Actually two because the first cover for my Gypsy was too small so it became my daughters barbie doll sleeping bag. And Barbie got a matching purse. And I still have about 1/2 a yard left over. WoW! How cute are these! The kiddos are going to love them!